http://instagram.com/p/c9scTvx6Xq/ This does not look good. Vikram What is it about? Cant click at the place! ramana wrote: Vikram What is it about? Cant click at the place! Fire on board two naval vessels according to press. No other details. There is a breaking news ticker on TimesNow though with nothing else substantial. A fire broke out on INS Sindhurakshak after an explosion in the Navy submarine docked inside the restricted Lion Gate area at the Mumbai naval dockyard. 18 sailors were inside the submarine. Could be sabotage knowing how inadequate the security at Naval Dockyard is. This is going to be a total loss for a submarine which went through an expensive MLU recently. Whatever it is .. not a good news..
all the more reason to speed up karwar and leave mumbai just for the CG to use. anyone with a RPG or makeshift mortar could lob shells into the naval docks right now. Last time there was an explosion of the battery. Explosion in INS Sindhurakshak (Diesel Submarine) docked at Colaba Naval Base Mumbai. Navy sources indicate it is almost sunk. 18 sailors and officers missing. INS Sindhuratan has also suffered some damages. Witnesses heard and saw three explosions and huge fireball. PS:This is terrible news .One can replace the sub,but the 18 missing submariners.One's heart goes out to the families..While not trying to throw blame at anyone at this tragic time,it underscores the difficulty of keeping old weapon systems fighting fit. Most of our all our Kilos are elderly and replacements for them should've already been in the pipeline.Knowing that the Scorpenes have been delayed so much,an interim solution should've been found much earlier.Now the IN/MOD will have no alternative but to go in for urgent interim orders since one sub appears to have been lost and another damaged. If the explosion was as massive as has been reported,with 16 fire tenders required to put out the blaze,one can write off the sub.Even if it is repaired,it will take about 2 years to repair,test,etc.This is a highly suspicious incident especially when the sub fleet is in deep trouble,due to declining numbers.While in the past,WW2 era,subs have been lost to battery explosions,battery tech has come a long way with much better safety.Here is an excpt. from Exide,a long time sub battery manufacturer. The Kilo has two 120-cell storage batteries.We are supposed to have developed our own superior batteries for the sub many years ago. The areas of operation of modern diesel-electric submarines are no longer just in coastal waters - long transits for many weeks on the open seas are typical today. Exide Technologies has developed submarine propulsion batteries with low-density active materials and low-volume, high-conductivity copper negative grids (patented 'CSM technology'), thereby achieving unsurpassable submerged sailing ranges. The latest submarine propulsion battery designs are protected from repeated underwater explosion by non-destructible shock elements. To minimize the dangerous snorkelling time the submarine propulsion batteries can be fitted with our patented 'Bottom Lug Connection'. Excellent life span - many batteries have been running for up to ten years and capacities of more than 100% after six years of operation is not unusual. However,if the sub is the Sindhurakshak,it suffered an earlier similar problem in 2010 at Vizag.that left a sailor dead. An accident involving the battery compartment on the Indian Navy's INS Sindhurakshak (S63) Kilo-class submarine, docked at Visakhapatnam, has left one sailor dead. The crew of the submarine has conducted full repairs and the boat is reported to be fine -- it will shortly depart on deployment in the Indian Ocean. The Sindhurakshak was commissioned in 1998 and was the second-last Kilo to be commissioned. Here is a blog of an accident aboard a US sub. "I hate to hear of anyone dieing on a boat. I dislike the whitewash of a "defective battery" being the cause. We learned a lot lessons and changed a lot of procedures to make our batteries safe. I don't see a defective battery blowing up without the help of poor procedures or lack of procedural compliance." Add to your list equipment errors. In the case of POMODON, an overhauled battery exhaust fan had been reinstalled wired backwards, causing a closed-loop ventilation path for the well. As result, during an in-port battery charge the battery ventilation was recirculating rather than being exhausted to the engines. Battery ventilation was at that time measured in this loop rather than external to the well, but the hydrogen detector was in the ship's ventilation line, external to the well. When the boat hit the finishing rate, the readings were 'correct' - good ventilation flow (though only recirculating the well) and low H2 (external to the well and isolated from it). But H2 was sure enough building up to explosive levels in the forward battery well and - sure enough - it exploded. Photos from the blast show the decking, all the joinery, and all the gear in the forward battery compartment plastered in a concave shape against the pressure-hull overhead. Four submariners were killed outright in the compartment and a fifth, just stepping through the WT door from the torpedo room, was popped like a cork the full length of the room and crushed against the jeep between the tubes. The effects of the explosion somehow caused a permanent port list that was finally fixed by removing #2 engine and giving the enginemen the best set of storage lockers in the fleet where #2 had been. I spent a day in the boat at Eureka CA in 1959 and got the whole story from the guys who lived through it - was stationed at a nearby SOSUS station at the time. That day and the crew's hospitality convinced me to stay in and reenlist for submarines. Meanhwhile while we continue to dither and fart,look at what the PLAN is doing! The Hindustan Times said in its report on April 9: China is scaling up its underwater capabilities, and the Indian Navy‘s submarine force levels will be the lowest in its history by 2015, a confidential defence ministry report has revealed. In comparison, “China may plan to construct 15 additional Yuan-class attack submarines, based on German diesel engine purchases. “It is said the Yuan-class submarines could be equipped with air-independent propulsion systems to recharge their batteries without having to surface for more than three weeks, a capability currently unavailable with the Indian Navy,” said the newspaper. In addition, China is purchasing advanced submarines from abroad. It has ordered 4 Russian Lada-class submarines, which are believed to be 8 times less noisy than Kilo-class ones. The newspaper says, “Six Scorpene submarines are currently being built at the Mazagon Dock Ltd in Mumbai with technology from French firm DCNS under a Rs. 23,562-crore project codenamed P-75. In comparison, China now has 13 Song-class, 12 Kilo-class, 7 Yuan-class and 18 Ming-class submarines. China only has 3 Han-class nuclear attack nuclear submarines as regarding nuclear submarines, China still faces many challenges. Nevertheless, Han-class attack nuclear submarines have been launched, that type of submarine is very noisy and easy to be discovered by Western sensors. From 1974 to 1991, China built 5 Han-class submarines, two of which have been decommissioned. China has also commissioned 4 relatively new Shuang-class nuclear submarines, but they are similarly noisy. At the same time, the Chinese navy have designed and built Type 039 Song-class submarines, which was designed and manufactured with stress on silencing effect. That class of submarines have been developed very quickly, and the newest 4 Song-class submarines have been designated as Yuan-class (type 039A or 041) submarines. According to the Indian report, in consideration of China’s purchase of German diesel engines, China perhaps plans to build 15 additional Yuan-class submarines. It is said the Yuan-class submarines could be equipped with air-independent propulsion systems to recharge their batteries without having to surface for more than three weeks, a capability currently unavailable with the Indian Navy,” said the newspaper. Type 039 submarines emerged for the first time in 2001. China has built 13 of them, but in 2008, an obviously different Type 039 submarine emerged. That type of submarine is referred to as Type 039A or 041 submarine. Having built two Type 039A submarines, China built two submarines of a type derived from Type 039 with the code name of 039B. That evolution is going on. At present, China already has 6 or 7 Type 041 Yuan-class submarines (including at least three different types). The newest version of that type of submarine is obviously equipped with an air-independent propulsion system and new type of electronic equipment, and is undergoing internal improvement. The quick evolution of the Type 039 submarine is perhaps an example of the incorporation of Russian submarine technology in the design ideas and new technology in that type of submarine. Since China began to build submarines in the 1960s, China has always been doing this. However, the design of the newest Type 41 indicates that the Chinese navy’s engineers have already had more creative ideas. It is believed that two or even more Yuan-class submarines are equipped with the air-independent propulsion system that enables them to stay for as long as two weeks under water. Western countries’ air-independent propulsion systems enable submarines to stay under water for two weeks or longer, but the functions and reliability of Chinese ones are a little inferior to similar Russian or Western ones. China will keep on improving its air-independent propulsion system just as it is doing in other areas of military technology. The Song-class submarine is very similar to he Russian Kilo-class submarine in appearance. Both Types 039 and 041 are 1800-ton grade, carry a crew of 60 and are installed with 6 tornado tubes. That is also very similar to the Kilo-class submarine, which is only a little larger. In the late 1990s, China began to purchase Russian Kilo-class submarines. At that time, it was the most advanced submarine available to China. The first two Type 041 submarines are obviously copies of the early type (Type 877) of Kilo-class submarine, but the next two seem to be copies of the relatively new Type 636 submarine. The newest Yuan-class submarines still look very similar to the Kilo-class submarines, but there may be evolution to make them similar to Lada-class submarines. Type 039 is the first Chinese submarine with a teardrop hull. The Type 041 submarine is regarded as an improved version of the Song-class submarine, but upon careful observation, especially on the Russian perspective, that type of submarine looks like a copy of the Kilo-class submarine. Russian people believe the entire project of Song/Yuan-class submarine is China’s long-term plan to successfully copy Kilo-class submarines. If that is the case, Chinese efforts seem quite successful. Last edited by Philip on 14 Aug 2013 07:58, edited 1 time in total. Tragic and Sad News. Hoping that the Missing Sailors are Safe. The explosion is huge and an ex Vice Admiral mentioned on Times Now that a fire on submariner can be caused by Battery with the rise of Hydrogen level or explosion on Weapons. This submarine in 2010 had minor fire on board due to battery issue. sad news. hope the 18 sailors are safe and have escaped. Sabotage can not be ruled out. This Sub had returned recently from Russia after extensive Modernisation. More tragic is the loss ( yet unconfirmed) of 18 highly motivated and trained sailors/officers. The news coming just before Independence Day makes it all the more poignant. I watched an NDTV clip.There was a huge fireball.Large damage to the dockyard too.A major catastrophe for the IN. so 18 sailors are trapped and many escaped ---? during the stay in the dock do the sailors remain in the sub? May be an weapon loading and unloading exercise going awry? Last edited by member_20067 on 14 Aug 2013 08:28, edited 1 time in total. those pics don't look good at all. A very tragic event. Our already depleted submarine strength suffers a jolt now. It has just recently undergone a massive overhaul. 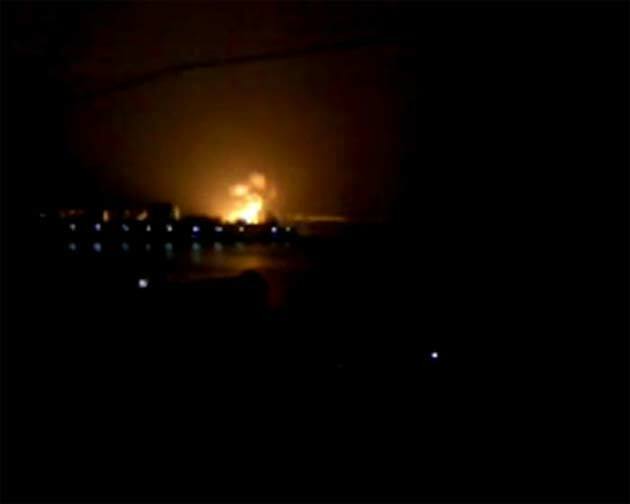 Praying that explosion only looks that bad because of the camera aperture at night, hope the sailors get out alive. batteries get overcharged and hot usually when ambient temperatures are high. Looks like this happened just before dawn when the temperature is the coolest. Also some of the warheads onboard got ignited causing the explosions. Being Mumbai one can't also rule out slums right next to dockyard. News in radio here is that the submarine has been fullly destroyed and taking with it all those who were trapped in it. A really sad day. If true may their souls rest in peace. in the confined corridors with doors open end to end, that initial huge explosion itself would have gone all the way through the sub. habal wrote: Being Mumbai one can't also rule out slums right next to dockyard. Been to these docks many times and the place where submarine is tied there are no slums around , you really have to drive some distance from Tiger Gate to reach these place where subs , ships are anchored. The only worry factor is I have seen these subs on pier side either placed in a straight line or in parallel , Not sure why it is done but in such event where one submarine catches catastrophic fire , the other might get impacted. They say Sindhratna which was in close proximity to Sindhurakshak got hit it but was saved. Edit: just noticed that this is a screen grab from the video posted by VikramSji. Sad news. Pray the 18 sailors are unhurt. An ex naval officer says the sailors might have locked themselves in an air tight section of the sub and may be rescued. Hope that is true. Time to place emergency orders again I guess, sigh. We should have taken the U-218(?) that Germany offered to us. We have lost any kind of numerical or technical superiority over the Pakis, the less said about China the better. looking at sub base in mystic CT they have invested hugely and it shows. 10 huge piers each capable of taking 2 subs..each separated by around 150m from the next one. all protected by a anti-frogman net like a necklace. around 8 subs seen in the pic of google earth. kings bay georgia also shows lavish covered degaussing facilities for the ohio class. quite clearly this is a watershed event and IN just cannot "manage" in mumbai for any more...they will have to vacate to other parts and more lavish facilities likewise any arms storages on trombay side. Some how reminds me of the blast that occured on kursk in 2000. On kursk, the Hydrogen peroxide from torpedo leaked thru the rusty casing and reacted with something to create a blast. The heat from the blast trigged detonation of warheads. Rus is already building some Kilo 636 for vietnam I think. we could just order a couple more off that line. I dont think anyone is keen on increasing scorpene order unless we get a feel for the first couple. Shiv Aroor in his channel (Headlines Today) says that a Club-S exploded. It seems that the Club_S was being loaded and after the loading it exploded. Seems like a repeat of the Kursk. A weapon exploded destroying the boat. Times NOW shows clips of two explosions, a small(er) primary and then a huge secondary one, consistent with something exploding first and then setting off warheads. There must have been serious loss of life all around if this was a loading operation and there were lot of folks milling round the the jetty and nearby. Expect number of dead to rise. The Russian weapons seem to have very poor reliability /quality issues.